Big thanks to Cary Watson of this parish for turning me on to Pascal Garnier who is a kind of a cross between JG Ballard and Jim Thompson with a distinct Gallic twist, if you can imagine such a combo. 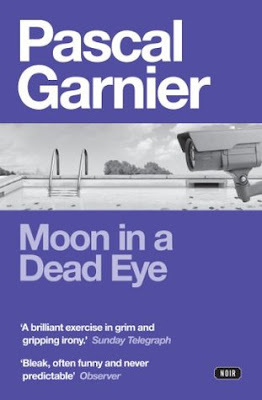 At a crisp 120 pages Moon In A Dead Eye reminds me of those brisk Ballard novels from the early seventies that wd have a simple 3 act structure. Act 1 introduces the characters and the problem, Act 2 the problems mount, Act 3 everything falls apart. Sick of all the young people disturbing their peace Martial and Odette Sudre move to a gated retirement community Les Conviviales in the South of France. They're the first to arrive and for a long time they're on their own wondering if they have made a huge mistake. It rains all the time and there's nothing much to do. Then Maxime and Marlène Node show up with their baby grand piano and gold jewellry. Max is an ex soldier and he thinks of himself as a lady's man and a player but he seems harmless enough. The two couples get to know each other and the caretaker, Monsieur Flesh, and Nadine who has been hired to organize group activities. One day the gate gets stuck and the couples are trapped in the complex. When the gate is finally fixed the feeling of paranoia increases as M. Flesh is seen killing a wild cat and when he informs the couples that a "dangerous band of gypsies has moved in down the road." Then another mysterious new comer arrives, Léa, who appears to be a bit unbalanced. Max produces a pistol to protect everyone from the "gypsy menace." The small group of five beings to argue with each other and gradually the shoddily built complex of Les Conviviales begins to fray. There may be an entire sub genre of French literature about this topic but my cultural references aren't so deep. For me it was a happy blend of Bonjour Tristesse, JG Ballard's Supercannes (and High Rise) and a little bit of Edward St Aubyn's Never Mind thrown in for fun. 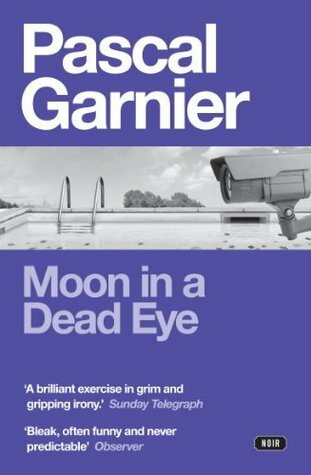 Moon In A Dead Eye has been described as a noir but to me it was much more a black comedy (and quite a funny one at that). It would make an excellent film perhaps starring Daniel Auteuil, Gerard Depardieu & Catherine Deneuve.